How much longer live women than men around the globe? Gender disparities in life expectancy are analysed in Gaptimer Report No. 2 ‘How much longer live women than men around the globe?’ World inequalities are studied by combining two sets of statistical measures: static gap at a given point in time and gap in time for a given level of the indicator, providing a broader picture. Firstly, it offers an innovative approach for looking at disparities over many units and over time. The new time distance measure, expressed in time units, is easy to understand by everybody and offers a novel way to compare situations in economics, politics, business and statistics. The time distance concept can influence the perception and decisions of people when they are assessing their relative position in their surroundings, in the society and across countries over time. Secondly, the empirical results concentrate on gender disparity in life expectancy around the globe (at the world level for 196 countries and some aggregates; for EU27 countries with 269 NUTS2 regions). While female life expectancy at birth is higher than that for males for 99.5 percent of the world population, there are astonishing differences among countries. For example, Estonia occupied rank 51 the world for females and 110 for males. On the other extreme, e.g. the rank for Qatar was 65 for females and only 12 for males. The time distance measure shows the reality with new eyes. The overall life expectancy the static difference between China and Sweden was less than 10 percent (which may appear to be small) while the S-time-distance was 51 years, (which gives a very different perception of the magnitude of the gap). For gender disparity in life expectancy S-time-distance for the world average, i.e. the horizontal time gap between trends of female and male life expectancy amounted to 20 years, 28 years for the EU27 and 35 years for the USA, showing a large and persistent gap in favour of women. Gaptimer Report No. 1 ‘World Inequalities in Human Development Index’ presents a new way of understanding and discussing development and world inequalities in a new dynamic framework. This manuscript can expand knowledge in two ways. Secondly, the empirical results for the Human Development Index over the three decades (1980-2012) provide new insights for the post-2015 agenda. 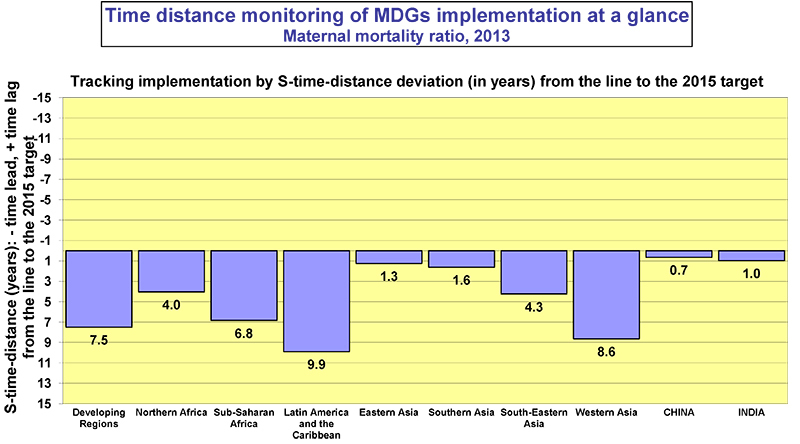 S-time-distance measure (calculations based on official UNDP data) estimates HDI inequalities for each of 187 countries within their peer group. Telling new stories includes inequalities within EU27, BRICS countries, and Gulf Coordination Council countries. These additional insights provide a transparent matter-of-fact message to politicians and the international community about the degree of urgency to tackle wide inequalities between and within countries in formulating and deciding on the post-2015 agenda. The book on time distance methodology by Professor Pavle Sicherl was published in Vienna. The time perspective, which no doubt exists in human perception when comparing different situations, is systematically introduced in comparative analysis both as a concept and as a quantifiable measure. Time distance is an innovative approach for looking at time-series data, it offers two improvements in the present state-of-the-art of comparative analysis. The first one is analytical and statistical – two novel generic statistical measures S-time-distance and S-time-step are generalised to complement conventional measures in time series comparisons, regressions, models, forecasting and monitoring, and to provide from existing data new insights due to an added dimension of analysis. Expressed in time units they are intuitively understandable; they can be compared across variables, fields of concern, and units of comparison. The second component is normative and theoretical, related to subjective perceptions, policy and welfare issues. Time distance concept can influence the perception and decisions of people when they are assessing their relative position in the society and across countries over time. Concept of the ‘overall degree of disparity’ combines static and time distance measures of disparity with the potential to bring new understanding in economics, management, research and statistics. Empirical applications analyse time distance differences between countries in the world, OECD and EU, regional disparities, transition depression, ICT and digital divide, and monitoring implementation of UN MDGs and Lisbon strategy in the EU. The book can be ordered online from Amazon or Edition Echoraum. At the occasion of the 50th Anniversary of the OECD SICENTER presents a visual overview across several decades of the development for all present OECD countries for selected indicators based on the time distance methodology. Time distance concept arranges the same data from the OECD Factbook 2010 in an additional way so that data are arranged by selected levels of indicators showing in which year these levels of the indicators were achieved by given country. The level-time matrix compresses original data from the usual time series table in the Factbook 2010 in a new easily understandable way while still containing the most important information. The table-graph in yellow colour shows the range of values achieved for a given country over the period from available data. This allows for a quick level comparison of the situation across the whole set of OECD countries and individual countries as well as of how many steps over levels of indicators was achieved a given country. The selected indicators are: life expectancy at birth, infant mortality, road fatalities, projections of population growth rates and of elderly population until 2050, employment rates, tertiary attainment, gross domestic expenditures on R&D, telecommunication access paths, gross domestic product per capita, international trade in goods and services, current account balance, and general government expenditures as percent of GDP. This additional way of presentation over many countries and many years provides a much better summary and understanding. The level-time table-graph for share of elderly population covers the period of 100 years (1951-2050). It is difficult to imagine that the usual table of 34 countries across 100 years with 3400 entries would allow such a compressed essence of the long-term information and visualisation for a relevant perception of the situation. For the majority of the selected indicators it is obvious at a glance that the differences between OECD countries are large. For instance, for gross domestic expenditures on R&D, GDP per capita and tertiary attainment the indicator values for the best countries are 4 to 5 times higher than for the lowest countries. While best practices are of interest it is obvious that policies have to be differentiated and adjusted to such wide differences in the circumstances. There is a wealth of information and possible comparisons in the tables; the comments provided are just some examples of such interpretations. ‘Seeing with new eyes’, to borrow the phrase from Marcel Proust, creates new knowledge, better understanding and material for telling new development stories. Annex 1 shows using the example for life expectancy how the level-time matrix can lead further to derivation of two novel statistical measures: S-time-distance and S-time-step. All three look easily understandable and are bringing even to general public additional understanding of the situation to build their perception about the disparities involved. S-time-step shows how many years were needed in the past to increase one year in life expectancy, thsi indication of dynamics depends only on the developments in the given country. The values of S-time-distance in the table compare the value for a country to the benchmark OECD average, showing the lead (-) or lag (+) in time against the OECD average.